This is one of the many, many recipes I’ve been anxious to make from Melissa Clark’s cookbook “In The Kitchen With A Good Appetite”. 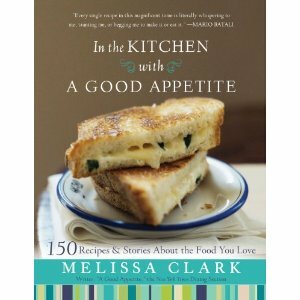 It’s one of those page turning books where just about every recipe you see has you mentally making your grocery list so you can be ready at a moments notice to whip up one of her creative and well thought out dishes in no time. I made a few slight variations to her original (I think Melissa would approve) in order to put my own stamp on it but for the most part, the recipe is all Melissa’s and it is truly scrumptious!!! Zesty and hearty… with a kick! I unfortunately didn’t have the red lentils she called for in her recipe so I used plain brown lentils. 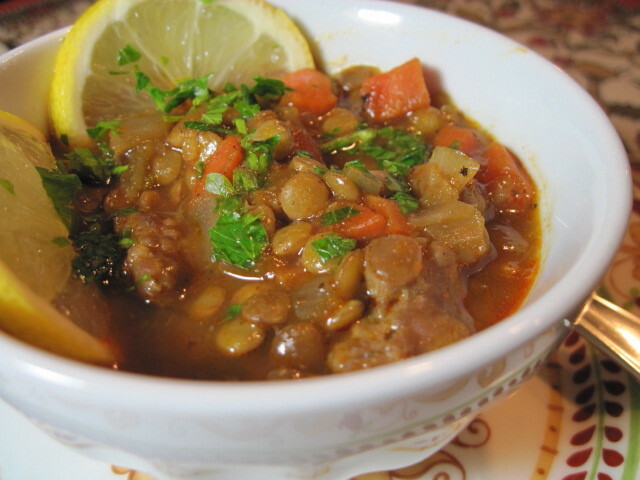 I say, use whatever kind of lentils you can find near you but don’t let the color (or lack of particular color) stop you from making this dish. 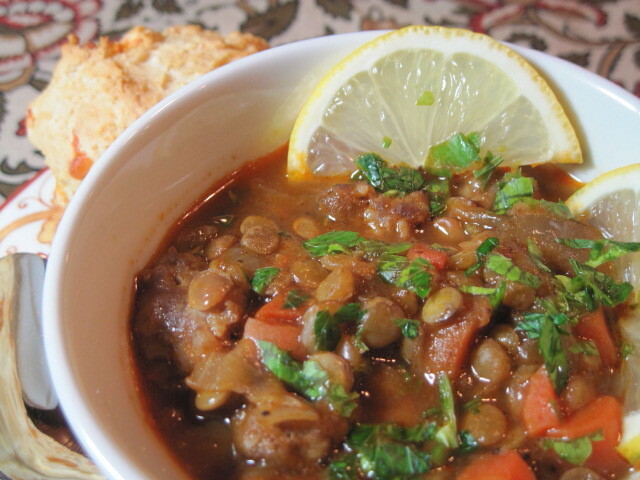 Red or brown, eat your lentils, they’re so good for you! Spoken like a true mom! – In a large pot, heat the oil over high heat until hot and shimmering. Add the Italian Sausage and cook until you can crumble it and it’s nice and brown. -Halfway through the cooking of your sausage, add the onions, garlic and carrots. Cook approximately 10 minutes on medium heat. -Stir in the tomato paste, cumin, coriander, salt, pepper and cayenne and sauté for 2 minutes longer. 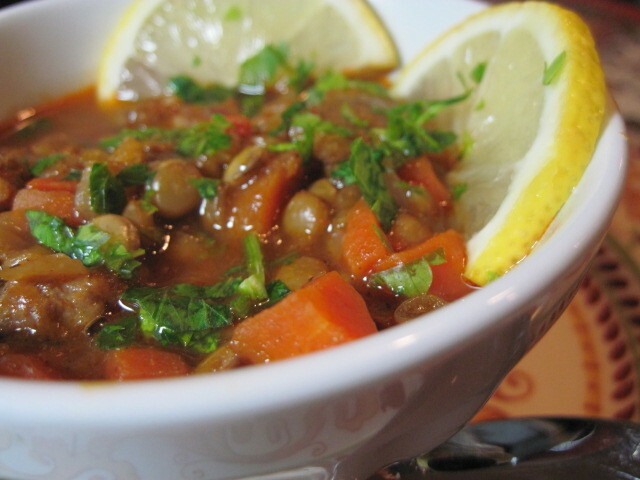 -Add the chicken stock, and the lentils. 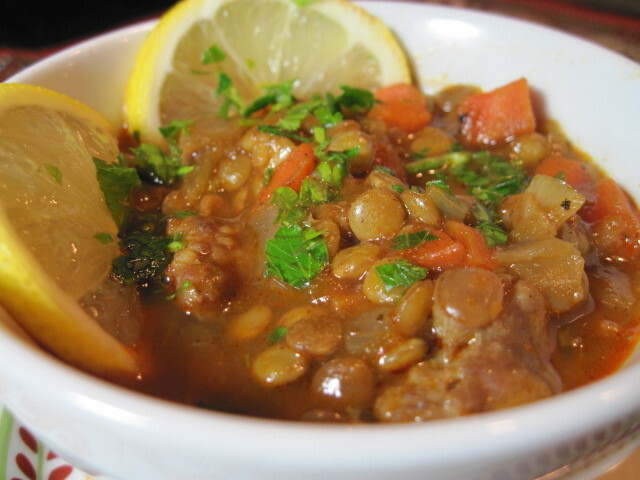 -Bring to a simmer and cook until the lentils are soft, about 30 minutes. -Right before serving, add the lemon juice and stir to combine all the flavors. -Ladle into bowls and garnish with fresh chopped parsley. Please note that the * denotes the few changes I made to Melissa’s original recipe. Where Melissa’s was once a soup, I made mine a bit thicker and stew like. If you would like to make yours more like a soup, you can add 2 cups water at the time you add your chicken stock. Melissa also suggested using an immersion blender or food processor to puree half the soup but I opted to keep the entire stew chunky and thick. 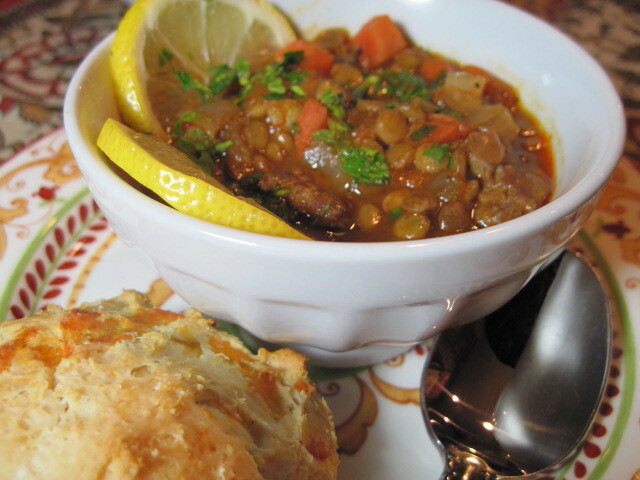 With the additional side of drop biscuits with cheddar and garlic, this was a meal that we truly all enjoyed (even my son who says he doesn’t like lentils) and everyone, even my son, just about licked our bowls clean and I never once had to say “Eat your lentils, they’re good for you”! They just did. Sweet!!! Thinking "On Top" Of The Box! Keeping My Gingham In Check! 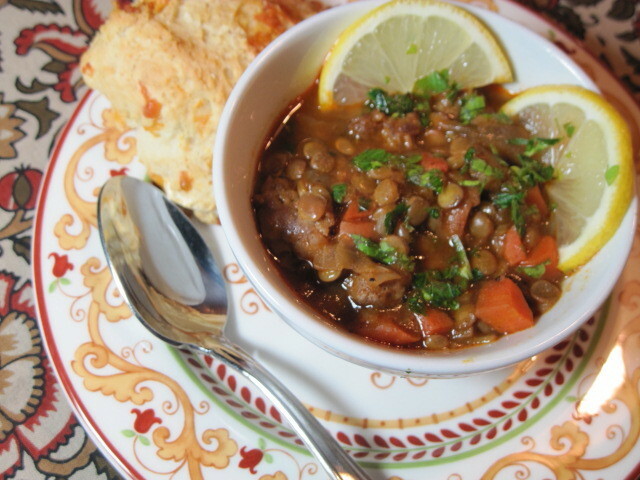 Your own version of Melissa's Lentil *Soup* looks so hearty and appetizing, so too does that (is it a home-made cheese bun) bun on the side of the dish! This looks really good. I recently got this book and LOVE it. I have it by my bed and read some each night (I'm rationing myself). I hadn't gotten up to this recipe yet, but I am going to put this on the list for this week. I made the granola and it was awesome.